There is a bug in Task Scheduler of Windows 10. 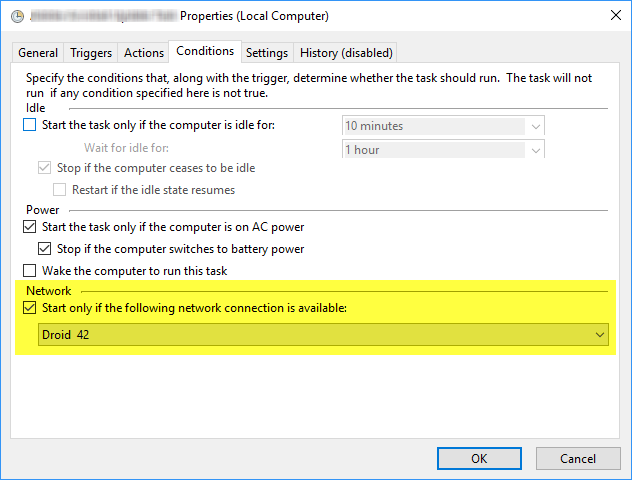 If the network condition of a Scheduled Task gets enabled and a specific network connection gets selected, the corresponding Scheduled Task will not run anymore. To reproduce the problem open properties of any Scheduled Task (right click on Scheduled Task -> Properties) and switch to the Conditions tab. Tick the box Start only if the following network connection is available and select a specific network condition. If Any connection instead of a specific connection gets selected or if the network condition gets disabled at all, the Scheduled Task runs again perfectly fine. A search on the Internet for this problem indicated, that a few other people had the same problem. However I could not find any entries in Microsoft Knowledge Base or Microsoft Connect. Because of that I decided to report a problem via Microsoft Feedback Hub. My feedback can be found here. Please upvote!